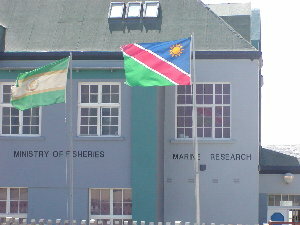 In January 2003 the Namibian islands were visited by a team of Namibians with invited guests. 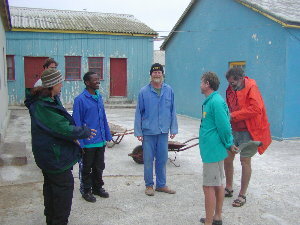 The four South Africans were Rob Crawford, Bruce Dyer, and Leshia Upfold from Marine and Coastal Management, and myself from SAFRING. Selected photos below illustrate some highlights. We left Cape Town on 19 January and drove the 1200 km to Luderitz. We stayed in a cottage on Shark Island. This island is joined to the mainland and the Ministry of Fisheries and Marine Research building is here. 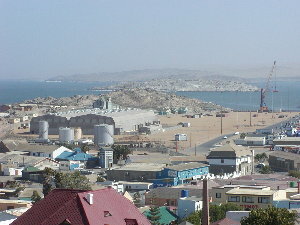 Luderitz is in the foreground and Shark Island in the background. 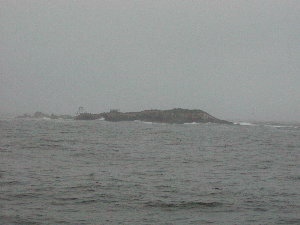 On 20 January we visited Halifax Island, travelling on the Kuiseb ship. 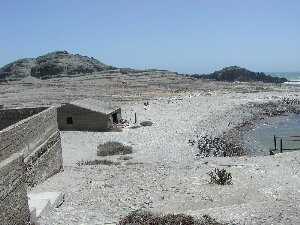 The houses were built for the guano trade but are now inhabited by penguins. Photo H.D. Oschadleus Jessica Kemper has a study population of African Penguins and we helped ring and weigh some of them. 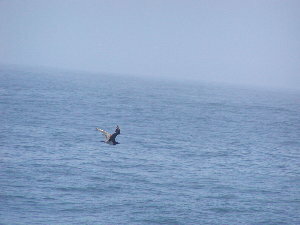 We also counted the breeding cormorants and ringed some Kelp Gull chicks. Photo H.D. 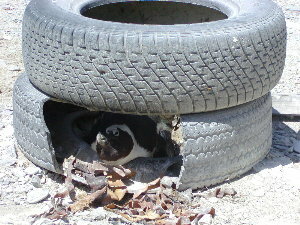 Oschadleus African Penguin 'burrow'. 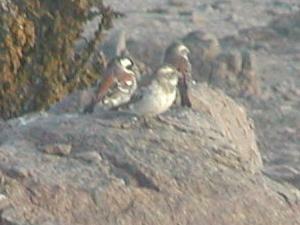 On 21 January we had some time to drive to Grosse Bucht, south of Luderitz. 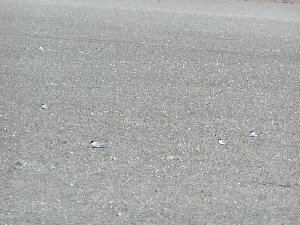 We found a flock of Damara Terns roosting on the saltpan plain. Photo H.D. 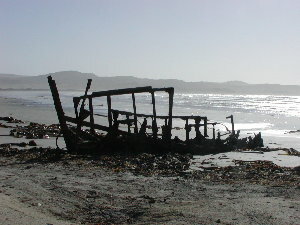 Oschadleus Wreck at Grosse Bucht. Photo H.D. Oschadleus In the afternoon we drove from Luderitz to Swakopmund where we were going to embark. 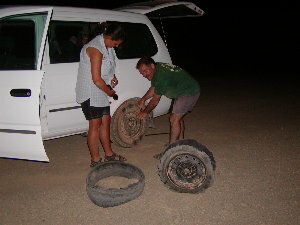 During the night we had a blown tyre! 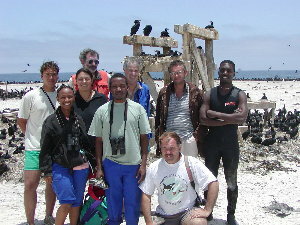 On 22 January we visited Bird Rock platform, a guano platform near Walvis Bay. Photo H.D. 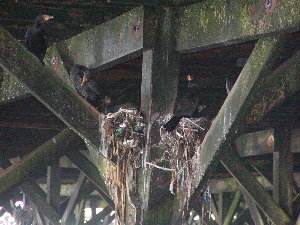 Oschadleus Crowned Cormorants breed on the struts holding up Bird Rock platform. Photo H.D. Oschadleus Cape Cormorants breed on top of Bird Rock platform. Some White Pelicans also breed on the platform; here an adult is feeding its chick. On 23 January we drove 120 km north of Swakopmund to visit the Cape Cross platforms. 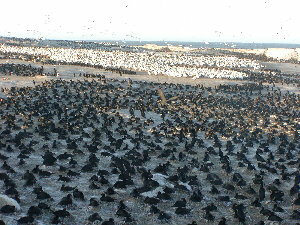 The Cape Cross North platform was fairly deserted with small numbers of Cape Cormorants and Kelp Gulls. Photo H.D. 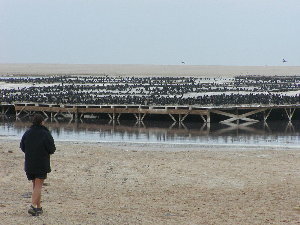 Oschadleus The Cape Cross South platform looked much better with about 15000 Cape Cormorants breeding on the platform. Photo H.D. 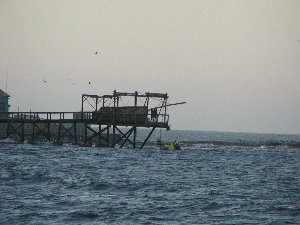 Oschadleus In the afternoon we visited the Swakopmund platform, with the owner Mr Klein. Guano is still scraped from the platform. Photo H.D. 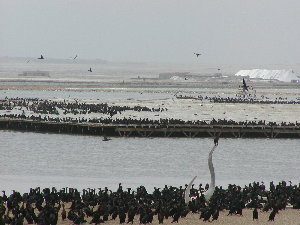 Oschadleus Cape Cormorants breeding on the Swakopmund platform. 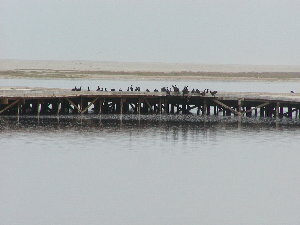 The cormorants in the foreground are roosting. 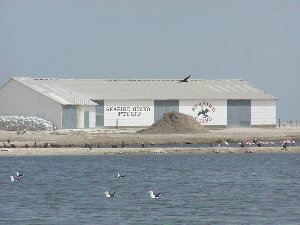 Note the saltworks in the background. Caspian Terns at the Swakopmund platform. 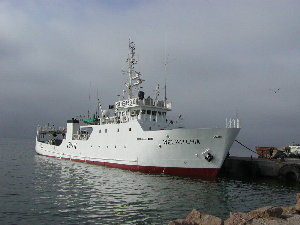 The Welwitchia in Walvis Bay harbour, the ship that took us to the larger Namibian islands over the next week. Photo H.D. 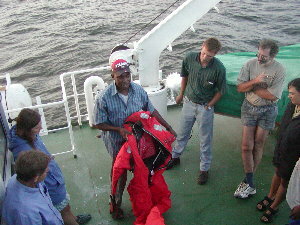 Oschadleus After boarding the First Mate gave us instructions on 'Safety at sea' on the Welwitchia; here the immersion suit is being demonstrated. 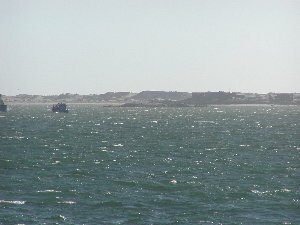 Hollamsbird Island - the sea was too rough to attempt a landing. 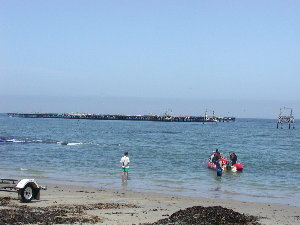 The old jetty and sealer's hut are visible on the left of the island. Photo H.D. Oschadleus While sailing between the islands several seabird species were seen, mostly Whitechinned Petrels. Here is a pale morph Arctic Skua. Photo H.D. 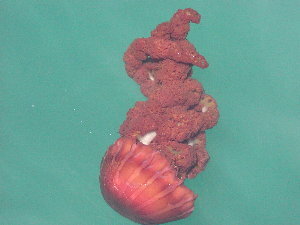 Oschadleus Jellyfish in the sea. Photo H.D. Oschadleus The only cetaceans seen were Heaviside Dolphins - this group frolicked around the ship when we arrived at Mercury Island. 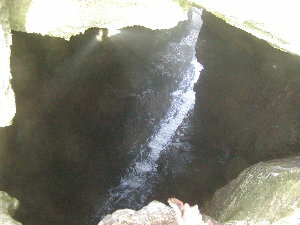 Mercury Island is a small island with steep sides. We worked on the island on 2 days - there was only space for a few team members to sleep on the island, the rest of us slept on the Welwitchia. Photo H.D. Oschadleus Landing at Mercury Island risks you landing in the sea - fortunately islander Rian Jones prevented that. Photo H.D. Oschadleus African Penguins breed on the steep slope behind the house on Mercury Island. Photo H.D. Oschadleus The centre of the island is hollow, with several entrances from different directions. In stormy weather the waves crashing together in the centre cause the whole island to shake! Photo H.D. Oschadleus One of our tasks on Mercury Island was to ring Cape Gannets. 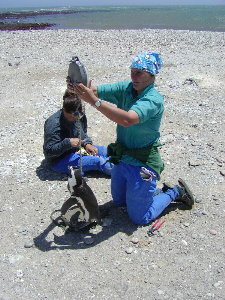 Here Ernita uses a hook to catch a gannet. 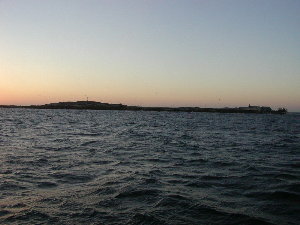 Neglectus Islet is the rock in front of the mainland with houses. Bruce and Jessica visited the island with a rubber duck to look for African Penguins. These have only recently started to make a comeback and are now a small but growing breeding colony again (with 10 active nests and another nest under construction recorded on this trip). We arrived at Ichaboe Island at dusk and stayed for 2 nights. Photo H.D. Oschadleus Getting onto Ichaboe Island was the most fun. Pete Bartlett has a hand-operated pully to hoist people onto the jetty one by one from the rubber duck. Several of the team went onto the island that evening to try and mistnet Leach's Storm Petrels - none were caught nor heard. Photo H.D. 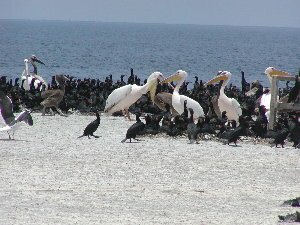 Oschadleus Cape Cormorants and Cape Gannets breeding on Ichaboe Island. Photo H.D. 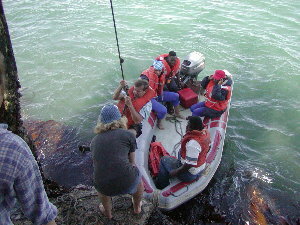 Oschadleus Pete and part of our team getting ready for work on Ichaboe Island. Photo H.D. 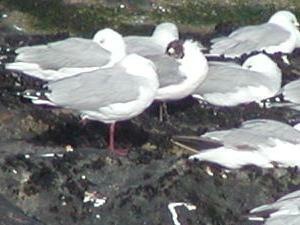 Oschadleus Franklin's Gull roosting with Hartlaub's Gulls on the rocks in front of the houses on Ichaboe Island - the first record of this rarity on the island. Note the black head, distinct white eye-ring, and slightly darker wings. 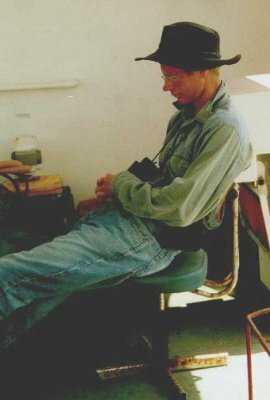 On our way to Possession Island we received a call from the smaller Kuiseb ship that it was having engine trouble. 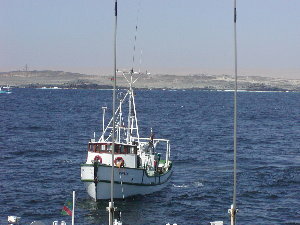 We turned around and towed the Kuiseb to Luderitz harbour before continuing our vaoyage. Photo Jessica Kemper As a result we arrived at Possession Island quite late at night and had the Welwitchia's bright spot-light to guide the rubber duck to the jetty. Photo H.D. 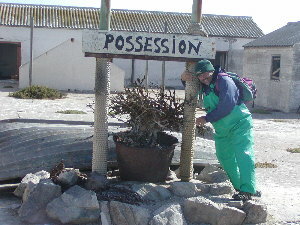 Oschadleus Bruce taking 'possession' of Possession Island! Photo H.D. 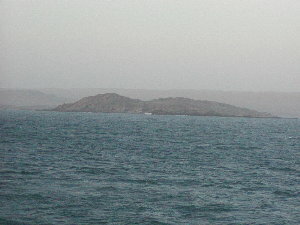 Oschadleus Possession Island - looking north from the south end. 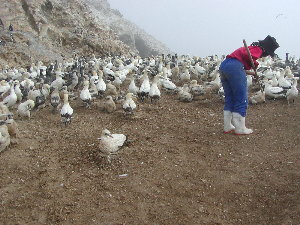 The aridity is noticeable on this island as it is not covered in breeding seabirds. 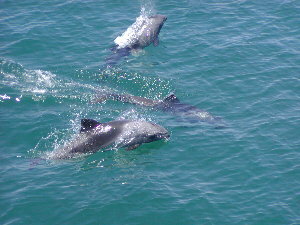 There are small colonies of African Penguins, Cape Gannets, Cape Cormorants and Kelp Gulls in sections of the island. Photo H.D. 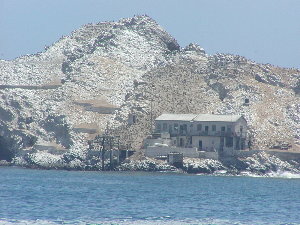 Oschadleus The small Cape Gannet colony on Possession Island. Islander Yves Chesselet erected a nifty ladder with a pulley for 'aerial' photography of the colony. Photo H.D. Oschadleus Cape Sparrows abound around the settlement. I put up a mistnet and caught 20 of them, including 2 retraps of Yves' birds. 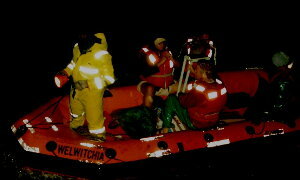 During the night we also tried catching Leach's Storm Petrels but with no success. After disembarking from the Welwitchia in Luderitz, we had a day in Luderitz to visit the last 2 islands, using a rubber duck. 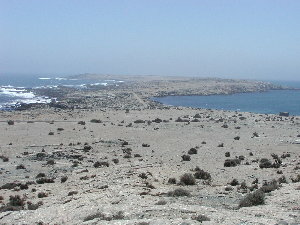 Both islands are rocky oucrops at the entrance to the Luderitz bay. 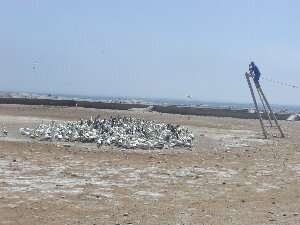 This is Seal Island where we counted the breeding seabirds. Photo H.D. 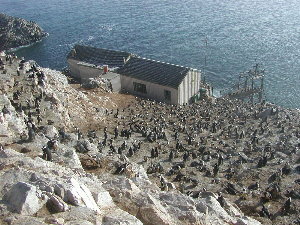 Oschadleus Penguin Island is slightly larger than Seal Island, and it has more species breeding, including Bank and Whitebreasted Cormorants. 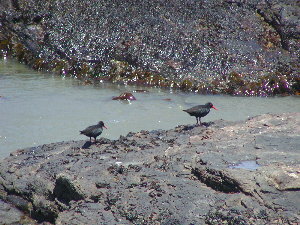 I counted the Black Oystercatchers (204 on Seal and 138 on Penguin) while Rob, Leshia and Benedict counted the cormorants. On 30 January we drove back to Cape Town. Photo H.D. 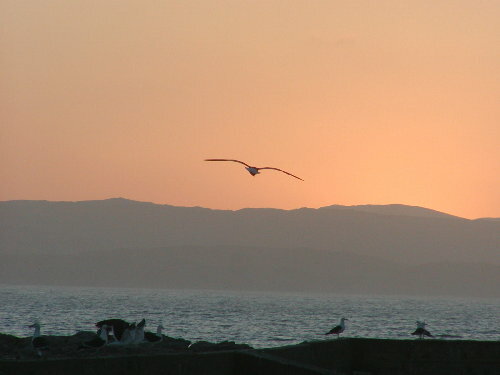 Oschadleus Kelp Gulls at Sunrise at Possession Island.